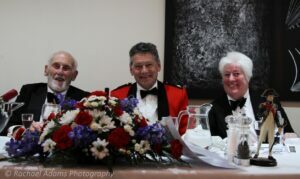 Pictured from left to right: Rear Admiral John Roberts CB, Mr Paul Auston DL representing the Lord-Lieutenant and Lt Caroline Goodwin, Sittingbourne Maritime Cadets and Commanding Officer. (c) Rachel Adams Photography. The Sittingbourne Maritime Cadets and Commanding Officer, Lieutenant Caroline Goodwin, hosted a Trafalgar Night Dinner at the Coniston Hotel, Sittingbourne on the 20th October to celebrate the anniversary of the Battle of Trafalgar and to commemorate the immortal memory of Admiral Lord Nelson. 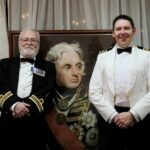 Representatives of both the Royal and Merchant Navies were in attendance and the Guest of Honour representing the Lord-Lieutenant was Mr Paul Auston DL accompanied by Rear Admiral John Roberts CB, who both made presentations of awards during the evening. Mr Auston presented awards to the Unit President, Captain James Kitney, for his support whilst being at Sea, the Unit Vice President, Mr Ron Lamb for appreciation and gratitude in support of what he has done for the unit, and Mrs Anne Hill, for supporting the Unit as Kent Poppy Organiser on the evening. 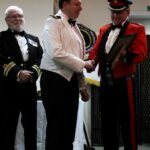 Rear Admiral John Roberts presented certificates to cadet Mariner Lee Gumbrill, who has achieved the advanced piping badge and to Mr and Mrs Moroni, for donating an 8 man tent. Captain James Kitney MN being presented with his award by Mr Paul Auston DL. (c) Rachel Adams Photography. From left to right: Lt Cdr Michael Goodwin and Capt James Kitney MN. (c)Rachel Adams Photography. 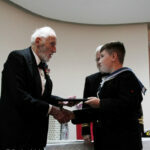 Rear Admiral John Roberts presenting Mariner Lee Gumbrill with his certificate. (c) Rachel Adams Photography.